As a self-made, multi-passionate mompreneur, I consider myself the queen of online learning. I think I am literally addicted to buying ebooks and e-courses! As someone who literally works, plays and sleeps next to her computer or iphone, I’m constantly using online courses to uplevel my skills or expand my knowledge especially in the areas of blogging, online marketing and real estate — all essential things for building my own profitable mini-empire. Now, if I was a betting woman, I’d say I wasn’t the only one who feels like this. Info products are exploding! Not only is it a convenient and easy way to learn, it is also a convenient and easy way to make money teaching on topics you love. You can learn just about anything online and there are new resources, tools, and platforms being creating all the time for people looking for an opportunity to earn a living teaching the information they learn with others. And what’s even more awesome is that you can earn just as good of a living selling small, affordable courses for $20 as you can selling $1000 courses. In fact, I’ve made more money and had more success selling e-courses and ebooks priced under $100 than any high-priced e-course or affiliate program I’ve promoted. Talk about PURE PROFITS! The info product income stream has been so lucrative that it’s allowed me to pull in thousands of dollars a month in passive income. Since changing my business model to focus more on creating and selling profitable info products, I’ve never been happier. I get to help a lot more people monetize their passion without the constraints of catering around deadlines. No more one-on-one coaching, no more relying on having to sell high-ticket affiliate products and no more wasting time doing things that took away the freedom and flexibility that drew me to online entrepreneurship in the first place. So, if you are standing in the same spot I was just a few short years ago, I’m hoping that this post will help you turn your profits into income, even if you are starting with ZERO budget! I’m going to take you through every single tool in the process of creating, delivering and selling your first e-course without spending a dime on delivery platforms, graphic design tools or marketing. Now, let me just put this out there…FREE or PAID, you still have to create a quality product people want and are willing to buy. If you need help coming up with your profitable info product idea check out my 14-day Monetize Your Passion mini-course. So, without further ado…. Let’s get started! Mind Map It: When it comes time to start building out my e-courses I always open up a new mind map. This is where I can dump general ideas, organize steps and group related topics into modules all on one blank sheet. MindMiester has a Basic plan where you get up to 3 mind maps for FREE! Researching e-Course Topics: To make sure your info product really delivers and drives results, what I suggest you do is research similar products, courses, ebooks and programs to make sure you didn’t miss any key details or steps. I like to hop over and search for books on the subject of my product. Use Amazon’s “look inside” feature to take a peek at the table of contents. Are you missing any topics that are a good fit for your e-course? In addition to Amazon.com, you can also reference similar e-courses on sites such as Udemy, Creative Live, and the sales pages of courses on Teachable and popular blogs in your niche. Organizing Your Course Content: Once you’ve created and organized an outline in your mind map and researched your topics, it’s time to beef up your course content. I do this in Google Docs. Google Docs is FREE and I like it because I can access it and edit it from my phone. If I have an idea or want to make a note while I’m out and about I can do it. Spell check with Grammarly: Double, triple check your e-course content with this amazing (FREE) Chrome add-on! Designing Your e-Course Content: So, once you have scripted out all your course content, it’s time to brand it. Create beautifully styled presentation slides and e-course workbooks using Keynote (mac), PowerPoint (pc) or Canva’s drag and drop design software. You can also use any of these free tools to create ebook covers, social media promo images, blog post images, sales page graphics, and more. Boom! Course Graphics: Pic Jumbo, Gratisography, The Noun Project, Dry Icons, and Creative Market are all amazing places to find graphics, images and icons for your e-course. *Creative market is a paid marketplace, BUT if you sign up for their newsletter, you’ll get free fonts, templates and stock images for FREE every Monday! Editable PDF Creation Tools: Most e-courses come with additional training resources such as ebooks, workbooks, checklists and action sheets. If you want to create your own fillable course materials, PDFEscape is a free online tool course creators can use to create interactive content for their students! Microphone: You don’t need an expensive microphone to create your e-course. Use the built-in microphone on your computer for free which most computers have. Recording Tool #1: Quicktime: Screen capture software available on most computers (pc and mac) to record your e-course audio and video tutorials. Create a presentation in Keynote or Powerpoint, launch your screen recording software to record your screen, and then “play” your presentation while speaking into your mic. Boom! Recording Tool #2: Jing: Screen capture software to record your e-course video tutorials. The downside with Jing is that your video recordings are limited to 5 minutes. Recording Tool #3: iMovie: Plan to be on camera? Or want to record something other than your screen? Then you may want to open up that iMovie app on your mac so you can capture that cute face of yours on video. Recording Tool #4: Webcam: If you don’t have the funds to invest, or don’t plan on being on camera often, then your computer or phone’s webcam would work just fine! Recording Tool #5: iPhone or iPad: Have a smartphone or tablet? Then use it to record and edit your videos. The editing features are pretty basic but if you are good at speaking in front of a camera (meaning you won’t have to do a whole lot of editing) then you can use your smartphone to record your entire online course! Splice: This editor, owned by GoPro, gives you separate tracks for video and audio to make more complex videos. you can add onscreen text, voice narration, and animations! Oh, and it’s free! Video Hosting: If you’re not using Teachable and need a place to host your videos on your WordPress or SquareSpace site, YouTube is a great option. Simply upload your video and change the visibility features to “Unlisted”. That way only your students with the direct link can view it! Website: Need to create sales pages, thank you pages and product delivery pages? You can do all of this and more by inserting text and a little bit of html code on a blank WordPress page. Plus, WordPress has quite a few free plugins to help you deliver your e-course securely and safely. There’s an entire lesson in my FREE 14-day mini-course, Monetize Your Passion, on how to get more eyeballs on your info products! Click here to get instant access. PayPal:Collect payments with the most popular Payment gateway online. Simply create a shopping cart button, add it to your product sales page and when someone buys you can redirect your new student to a hidden blog page, protected thank you page or download page with instructions on how to get access to their course! Stripe: Another popular payment gateway similar to PayPal! Now, this is where we get into the tools that can make or break your profits. Contrary to popular belief, you don’t need to invest in Facebook Ads and promoted posts if you have a solid social media strategy! Email service provider: If your goal is to create an online empire, you can’t do it without an email list. You’ll need to sign up with an email service provider if you haven’t already. I recommend Aweber, which you can get for $1 for the first 30 days (almost free…lol! but if you market and sell just ONE e-course I’m sure you won’t have a problem “justifying” the cost!) If you want a free option and have less than 2000 subscribers on your list, I suggest starting with Mailchimp, which let’s you send up to 12,000 emails per month absolutely free! No expiring trial, no contract no credit card required! Holla! Your Blog: If you know you are launching an info product about a certain topic, you can create a series of blog posts related to your e-course topic so that it attracts the people you want purchasing your product. Also once you launch your course you can insert your call to action and buy now button in place of your opt-in button. Social Media: One of the great things about social media is that you can literally build an army of fans for free. Whether it’s Facebook, Instagram, Pinterest or Periscope, social media can be a great place for social proof. Use your social media accounts to share testimonials, to welcome new students to your product, and to retweet or reshare positive comments that people have made about your product. Social proof is all about showing potential customers that past customers have gotten value from your product. It can also show people that others have joined, too. Webinars: Workshops and live webinars are powerful for selling products and explaining to your audience what your e-course is about and you can launch a high-quality webinar using Google Hangouts on Air (unlimited audience) or Zoom.us (host up to 50 peeps for up to 40 minutes). Webinars have some of the highest conversion rates around, and the great thing about webinars is that when people register they also become a subscriber to your email list as well. After your live webinar ends, I also recommend sending out a recording, as some people won’t be able to attend live. When you send out the “replay,” also send information about your product. Facebook Groups: If you don’t have a private Facebook group of your own where you can promo your products, leverage the audience of other influencers in your niche. If they have promo days get into the habit of sharing your e-course launches and info products there. It’s a great way to continue to promote your products even after your initial launch #passiveincome! Want more creative ideas for promoting your e-courses and info products? 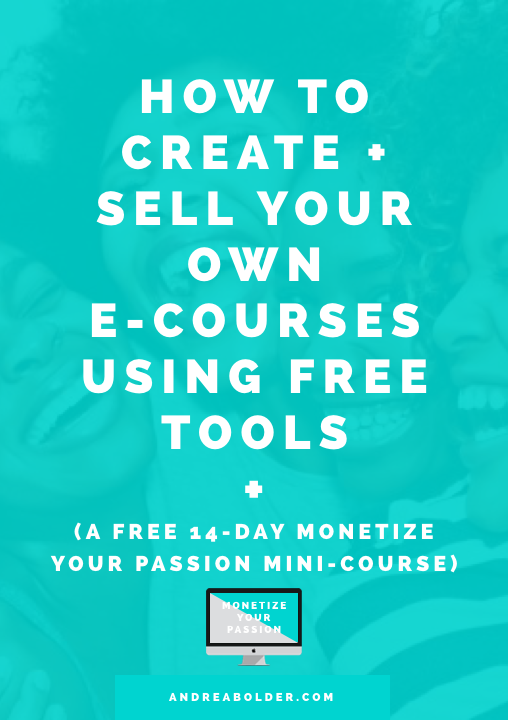 There’s an entire lesson in my FREE 14-day mini-course, Monetize Your Passion, on how to get more eyeballs on your info products! Click here to get instant access. ANY OTHER COOL (AND FREE) TOOLS FOR CREATING E-COURSES? SOUND OFF IN THE COMMENTS! I’m in the middle of building my first course and this was by far the most straightforward and valuable advice post. Thanks! Love it. I’m in the process of launching an e-course and this helped tremendously. So happy this was helpful to you! Keep me updated on how our launch goes!! Hi! Such an awesome post way overwhelming! Do you over course creation as a service? I’m looking to create a 21 day course.